MINNEAPOLIS -- The national championship can be won or lost in a moment. An errant pass, a foul, a split second judgment call. The 2019 national championship was decided in such an instance. 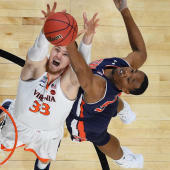 With 1:06 remaining in Monday night's thrilling national championship game that ended with Virginia claiming its first title, a judgment call on the court was overturned. Texas Tech's Davide Moretti was driving up the court in transition and in traffic when De'Andre Hunter got a fingertip on the ball and knocked it out of bounds. The call on the play initially awarded Tech the ball trailing 75-73. After a lengthy review, however, the call on the court was overturned. It further cemented the Red Raiders' inability to come back when, 25 seconds later, Matt Mooney fouled Ty Jerome, who made both free throws to extend UVA's lead to four. It would not get closer as the Cavaliers closed from that moment on a 10-4 run to end the game. The officials did not blow the call. After a review, it appears Moretti's right pinky got just enough of the ball after Hunter's deflection that it changed the call. It changed the momentum, the course of the game. If Texas Tech hits a 3- there, does Virginia respond? If Texas Tech makes a jumper, do we have a second overtime? What-if all you want -- and Texas Tech fans surely will -- but the split second instance was an inflection point that, in the large view, could have played the biggest factor in who was crowned the 2019 national champion.